Unnakkaya is delicious, sweet and traditional Kerala snack prepared mainly in the Northern Kerala (in Malabar, Kannur, Thalassery etc) during the Ramzan days. Its very popular in other parts of Kerala also during the Ramadan (Ramazan) fasting time. It is prepared by filling smashed bananas stuffed with cashew nuts, raisins and rice flakes. Unnakkaya is a good snack item which can fill the snack box and can be served as an evening snack for your kids. Kids and adults will love it. Try this recipe at home and let me know your comments. Boil the banana, peel off the skin and mash well and keep aside. Heat ghee in frying pan and stir-fry cashew nut and raisins along with coconut and cardamom together. Add sugar to the mix and stirr well. Add aval / rice flakes / flattened rice. Remove from the stove and allow it to cool. Apply a touch of ghee on both the palms. Divide the mashed bananas into evenly sized small balls. Press a little with the help of a thump and stuff the mixture carefully inside and seal both the ends and give a shape of unnakkaya (Shape it into cylinder). Heat the oil in a deep bottomed pan and deep fry the bananas into golden yellow in color. Do you need more banana recipes? 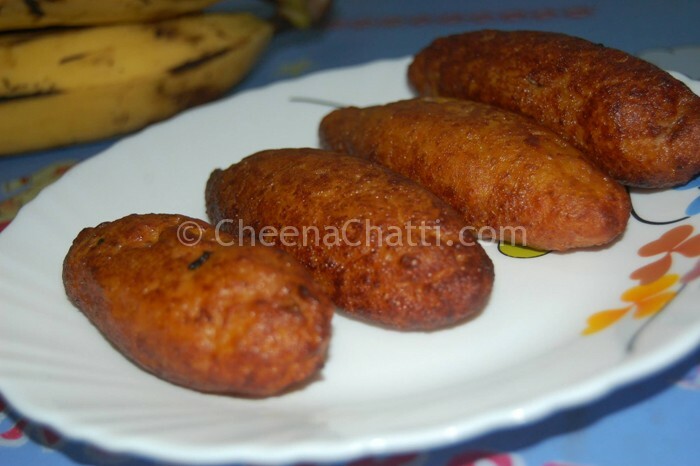 This entry was added on April 1st, 2013 by Athira Sooraj in Bakery and tagged with tasty unakai recipe, kerala snacks, kerala unakai, banana, unnakkaya recipe, ramzan recipes, malabar unakai, how to make unnakkai, iftaar recipes. Last revised on March 27th, 2018. @Miju : Thanks for stopping by and commenting. Don’t forget to share the outcome with us. Is ethapazham used in this recipe? or any banana would do? @Ida: Smashed Bananas / Ethapazham is used for the preparation.